B2B buyers are increasingly using mobile to obtain information, conduct research, and buy products and services, making it an effective marketing channel. But mobile can still be a little mysterious and understanding how to use mobile marketing to generate leads can be a challenge for even the most experienced marketer. 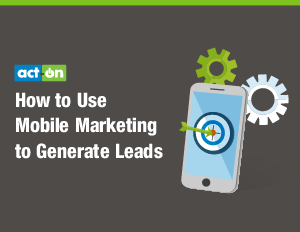 In this eBook, you’ll learn the complexities behind mobile marketing in the B2B environment and get nine action steps you can take to generate leads with mobile.